← Cutting the s3mt, beheading the Enemy. Cutting the s3mt, shaving the Mourners, offering the Udjat eye. According to what we have seen all along this last part of the work, there is a coincidence among cutting the s3mt, shaving the mourners in the role of Isis and Nephtys and giving the Udjat eye. We are at the end of the resurrection process made for the mummy. The two mourners incite with their actions the Osiris’ corpse reanimation, after that Osiris is mentioned under a lunar appearance; as Papyrus Louvre I, 3079 says: “gets into the Udjat eye, joining him. Thoth collects the constitutive elements of the eye; afterwards the sadness is captured, because you get up to the sky with it”. The Egyptian myth of Osiris tells how, once the corpse of this god was restored, Horus gave him the Udjat eye (the healed lunar eye of Horus). With this offering, Horus helped in the final reanimation of his father. The presence of the son is relevant, because it makes necessary the restitution of the deceased’s virility. The result is the Triad (in this case Osiris, Isis and Horus), which is such a common concept in many cultures. Scholar G. Durand considered the Triad had a lunar nature, since the son’s figure, as an extension of the family line, helps in defeating temporality. On the other hand, the Horus presence means the appearance of the living masculine side as a complement of the feminine one incarnated in his mother Isis. G. Durand’s theory is that the origin of the son’s image would be in the primitive androgynous version of the lunar divinities, having so the masculine (son) and feminine (mother) values together. In ancient Egypt belief, as in all cultures, these two values are necessary for generating life, so in the funerary context they are essential for the deceased’s rebirth. Horus gives his healthy eye (Udjat eye) to his father and that means the lunar resurrection of Osiris, who becomes “the lord of the Udjat eye” . According to some chapters of the Coffin Texts this moment has something to do with cutting the lock of hair s3mt and/or shaving the mourners in the role of Isis and Nephtys. But what does the iconography says? The tomb of Sobekmose in el-Rizeikat dating from the reign of Amnehotep III has a very important relief of the mortuary ceremony located in the north wall of the funerary chamber. 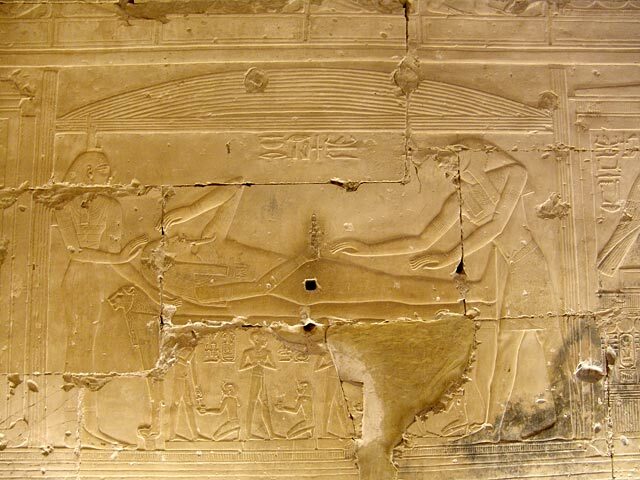 On the right Anubis is embalming the mummy while the coffin on a sledge is pulled by seven men. 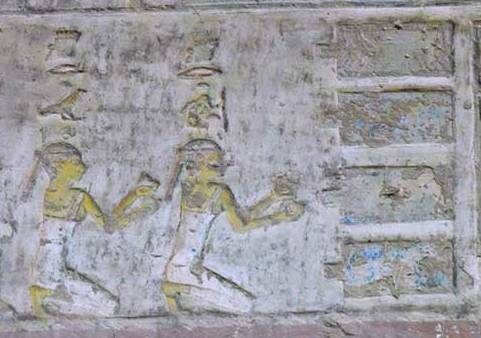 On the left the two mourning women with no mane of hair are the Drty or “the two kites”, the women impersonating Isis and Nephtys; they are facing the mww dancers. Drty and mww are usually represented in the final moment of the funerary ceremony. We have seen that the day of giving the Udjat eye is the day of shaving the mourners, and the cut of the s3mt, a Heliopolitan rite, is related with the healing of the lunar eye, so has a lunar nature. Taking that into consideration, it is tempting to relate the expression “the day of cutting the s3mt” we have read in Coffin Texts with “the day of completing the Udjat eye” in the tomb of Sobekmose. We have already suggested the idea of cutting the lock of hair as a way of symbolising the maturity of the moon, so becoming the full moon (Udjat eye). Hair, moon and Heliopolis converge in ancient Egypt already from at least the Old Kingdom in the figure of the girl Hwnt . According to the Pyramid Texts she is “the great young who is in Heliopolis…she has given you the two arms“ and”she put her arms over you” . A. Erman and H. Grapow considered Hwnt wrt as a goddess in Heliopolis, who in the late period was assimilated to Hathor and Nephtys. The Pyramid Texts describe her as “the little girl who is in the eye of Horus” , that is, the pupil in the eye’s god. The hieroglyph of a girl with a lock of hair as determinative, made H. Kees think of the lock of hair as a symbol and substitute of the lunar eye; as a consequence he considered the girl with the lock of hair in fury as the damaged eye of Horus, while the hair sm3 was the damage itself. By extension we could also relate the shave of the mourners with the two mourners with short hair of the tomb of Sobekmose. They are not the only examples. We count on many tombs with images of the final funerary rites with the two Drty with no mane: the tomb of Sobekhotep and Rekhmire in Gourna, the tomb of Pahery in el-Kab and the tomb of Nefersekheru in Zawyet Sultan (all of them dating from the New Kingdom) show the Drty with short hair at the end of the funerals offering two globular vases in front of the four pools; while the tomb of Renni in el-Kab has an image of the mourner with short hair wrapping a person with a kind of clothing. The most explicit iconography about what happens in that moment of the funerary ceremony is the tomb decoration of Rekhmire. It shows how after the Opening of the Mouth ceremony, a woman with short hair is offering green make-up. Women (mourner) offering the make-up. Detail from the south wall in the tomb of Rekhmire. XVIII Dynasty. That is something already documented in the Old Kingdom Pyramid Texts, where we can read: “make up the intact eye of Horus in your face”  or “Horus has made up to you his eye” . Also in the Coffin Texts we can find many mentions to that practice, as for instance: “…I make up to you a green eye of Horus in your face” , “green make-up and black make-up I give you the eye of Horus, black and white…they will lighten your face” . Giving the make-up is a synonym of giving the Udjat eye. According to Z. el-Kordy, “the offering of the make-up was a way of making the full moon to come back and avoiding the cosmic disorder”, so it was a rite with lunar nature. In the Egyptian funerals it symbolized the victory of Horus over Seth and the offering of the healed eye (Udjat eye) to the deceased, who will come back to life as did Osiris in the legend. We have seen that in the Egyptian funerary texts to cut the s3mt was related to the healing of the eye of Horus and with the shave of the two mourners. The Egyptian iconography shows us the offering of the make-up (Udjat eye) after the Opening of the Mouth ceremony and made by a mourner without mane of hair. And also many tombs decoration show the two mourners at the end of the funerary ceremony with no mane. Everything points to an Egyptian funerary custom of shaving or cutting a piece of hair of the two mourners in the role of Isis and Nephtys. But, when? Pap. Louvre I, lines 49-52. Pap. Louvre I, line 51. Songs…, 10, 3. For some scholars, the writing of the Osiris’ name means “the place of the eye” (W.B. Kristensen, 1992, p. 17). H. Kees, 1925, p. 6. Z. el-Kordy, 1982, p. 201. This entry was posted in 04. HAIR AND THE EYE OF HORUS and tagged ancient egypt, cut, dead, death, drty, hair, heliopolis, Horus, Isis, kite, lock of hair, make-up, mane of hair, nwnt, offering, opening of the mouth, Osiris, s3mt, samt, shave, triad, Udjat eye. Bookmark the permalink.